In English, question words are usually placed at the beginning of the sentence. In Chinese, you do not need to change the word order. Just place a question word instead of the thing/person/place, etc. you want to ask about. 这是我女朋友。– Zhè shì wǒ nǚ péngyǒu. – This is my girlfriend. 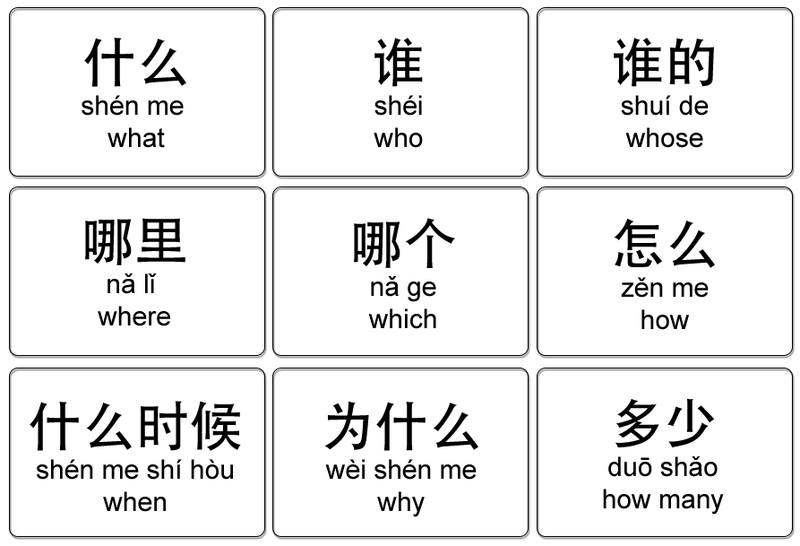 这是谁？– Zhè shì shuí? – Who is this? 她去上海。– Tā qù shànghǎi. – She is going to Shanghai. 谁去上海？– Shuí qù shànghǎi? – Who is going to Shanghai? 这是我的电脑。– Zhè shì wǒ de diànnǎo. – This is my computer. 这是什么？– Zhè shì shénme? – What is this? 我的电脑在桌子上。– Wǒ de diànnǎo zài zhuōzi shàng. – My computer is on the table. 你的电脑在哪里？– Nǐ de diànnǎo zài nǎlǐ? – Where is your computer? 这本书是我的。– Zhè běn shū shì wǒ de. – This book is mine. 这本书是谁的？– Zhè běn shū shì shuí de? – Whose book is this? 这个人是日本人。–Zhège rén shì rìběn rén. – This man is from Japan. 这个人是哪个国家的？– Zhège rén shì nǎge guójiā de? – Which country is this man from? NOTE: The quantity-related question words are 多少and 几. The first one can cover any number and does not require a measure word. 几 is used for numbers up to 10 and always requires a measure word. 我有很多钱。– Wǒ yǒu hěnduō qián. – I have got much money. 你有多少錢? – Nǐ yǒu duōshǎo qián? – How much money have you got? 我有两个孩子。– Wǒ yǒu liǎng gè háizi. – I have got two children. 你有几个孩子？– Nǐ yǒu jǐ gè háizi? – How many children have you got? 你什么时候去上班? – Nǐ shénme shíhòu qù shàngbān? – When do you go to work? 我8点去上班。- Wǒ bā diǎn qù shàngbān. – I go to work at 8. 你为什么不要吃饭? – Nǐ wèishéme bú yào chīfàn? – Why don’t you want to eat? 我不太饿！ 我不要吃饭。– Wǒ bú tài è! Wǒ bùyào chīfàn. – I am not too hungry. I do not want to eat. 他怎么去北京？- Tā zěnme qù běijīng? – How does he go to Beijing? 他坐飞机去。- Tā zuò fēijī qù. - He takes the plane.